A few weeks ago, a new Gundam anime was announced—and with it, new Gundam model kits. Now Bandai’s released high-res pictures of the kits, giving us our best actual look at the Mobile Suits of the upcoming series. There’s not much different between the two Barbatos models (what’s the plural of Barbatos? Barbati?) other than their weapons—the 1/144 model has a big ol’ robo-mace to swing around, as well as a sword, while the 1/100 model comes with a large beam rifle and another sword. They do, however give us our best actual look at the new Gundam and other mechs, considering the reveal trailer was suitably stingy on revealing much of either. It’s no surprises that Gunpla kits are our best look at the series so far given their popularity, but it’s welcome to get to look at some rad-looking Mobile Suits. 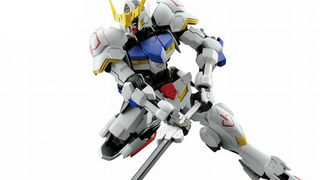 The three 1/144 scaled kits will be available in Japan in October to coincide with the premiere of the new anime, with the larger 1/100 Gundam Barbatos available the following month. Importers, get those wallets at the ready!